Bristol Baby! There's always a lot of bumping and running...and paint left on the walls. Cut tires and smashed cars. Oh, and lots of goofy things said. 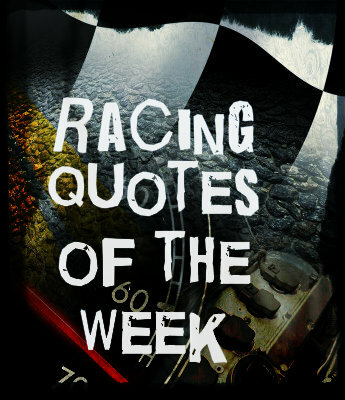 Here's my offering for the race quotes of the week. "...huge advantage to be in front..."
Yes, I can see where it might be. Less mess. "...trying to do something up front..."
"...that trio there, they are closing in..."
For? Again, you really should clarify. Or give pictures. "...you can throw a blanket over first through seventh..."
Maybe they planned it that way. You never know. They might be cold. "...gotta be able to work the bottom..."
Generally helps. Though a little action on top is good, too. "...has to lift and wait for an opening..."
Thanks for reading and stay tuned for next week from Auto Club Speedway!